If you’re a Tarantino fan, you’ll get what you came for, and even if you aren’t, there’s enough adrenaline and intelligence on both sides of the camera — Waltz’s terrifying performance was honored by the Cannes jury this year — to make “Inglorious Basterds” a genre-busting good time. And even if you wish he’d calm down a bit and rely more on his considerable skills at straightforward storytelling, this World War II saga is undeniably suspenseful, violent and entertaining. “Basterds” begins with a conversation between a French dairy farmer and Nazi officer Col. Hans Landa (Christoph Waltz). Their chat begins quite innocuously, but soon the suspense becomes almost unbearable, as Landa tries to make the farmer admit that he’s hiding a Jewish family in the cellar. Tarantino has loved to shoot people-sitting-around-a-table scenes since his debut “Reservoir Dogs,” but here he ratchets the tension in this set-up to new heights; the fact that such scenes in “Basterds” involve a Nazi (who’s armed) and a non-Nazi (who’s hiding something) certainly helps to keep the audience on edge. The only survivor of Col. Landa’s visit is Shoshanna (Mélanie Laurent), who runs off to Paris to live with an aunt and uncle who own a movie theater. Living under the name Emmanuelle Mimieux (that alias is just one of dozens of film-geek inside jokes peppered throughout the movie), she does her best to avoid the Nazi occupiers. That all changes when young German soldier Fredrick Zoller (Daniel Brühl) begins chatting her up outside the theater. 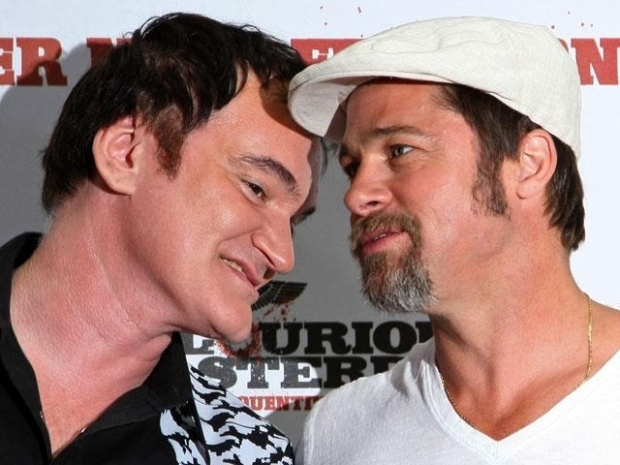 "Inglourious Basterds" writer/director Quentin Tarantino discusses why he chose megastar Brad Pitt for the lead role and why this script was so meaningful to him after writing "Pulp Fiction." Zoller, it turns out, isn’t just a movie enthusiast falling for Emmanuelle — he’s a Nazi war hero, a sharp-shooter who survived alone for days in a bell tower while surrounded by American soldiers. And now, as the star of a propaganda film about his exploits, Zoller prevails upon Joseph Goebbels (Sylvester Groth) to premiere the movie in Emmanuelle’s cinema. Naturally, when Hitler (Martin Wuttke) himself plans to attend, Shoshanna/Emmanuelle plans to burn the theater down using volatile old nitrate film stock, killing off the leaders of the Nazi party. Unbeknownst to her, the British army is also planning an assassination at the premiere, sending a film critic behind enemy lines to contact German film star and Allied spy Bridget von Hammersmark (Diane Kruger) to infiltrate the gala evening and kill the Third Reich head honchos. Tarantino does a masterful job of keeping these plates spinning, although you may have noticed that the titular “basterds” don’t have a whole lot to do with the plot. Led by Lt. Aldo Raine (Brad Pitt, in a fairly minor role despite his top bidding), they’re a team of American Jews whose goal is to kill off as many Germans as possible. And suffice it to say that when Raine says he wants his men to collect “Nazi scalps,” he’s not speaking figuratively. The suspense and action and performances are all so spot-on here that I couldn’t help feeling disappointed when Tarantino would play one of his Brechtian canards, like using the David Bowie theme song from “Cat People” or joltingly identifying one of the basterds with a freeze-frame title card, complete with blacksploitation-era font. It’s one thing when Godard violates the fourth wall, since he tends to use distancing devices throughout. But in an otherwise crisp and thrilling war picture, it feels like Tarantino’s falling back on old tricks out of fear that viewers might not otherwise be engaged. 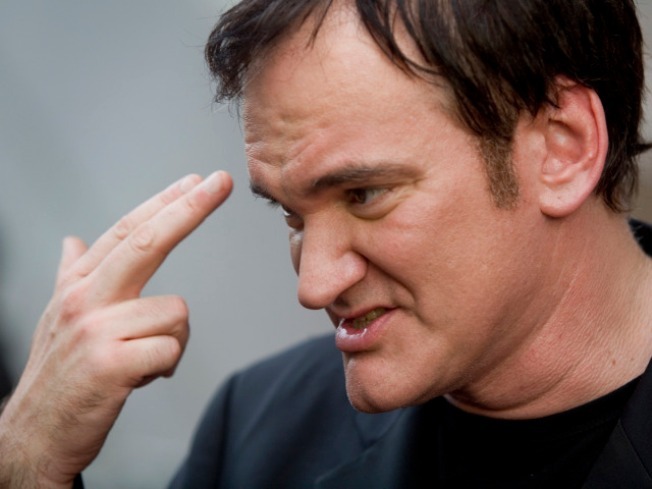 Granted, that’s the sort of thing that Tarantino does and is known for, so I repeat that if you’re a fan, you’ll get what you came for, and even if you aren’t, there’s enough adrenaline and intelligence on both sides of the camera — Waltz’s terrifying performance was honored by the Cannes jury this year — to make “Inglorious Basterds” a genre-busting good time. Follow msnbc.com Movie Critic Alonso Duralde at http://www.twitter.com/MSNBCalonso.